The Aruba 2930F Switch Series is designed for customer creating digital workplaces optimized for mobile users. These Layer 3 access switches are easy to deploy and manage with advanced security and network management tools like Aruba ClearPass Policy Manager, Aruba AirWave and cloud-based Aruba Central. Virtual Switching Framework (VSF) provides stacking scale and simplicity for enterprise edge, SMB and branch offices. The 2930F delivers performance and value with support for RIP routing, Access OSPF, 10GbE uplinks, up to 740W PoE+, robust QoS, and requires no software licensing. Features: The Aruba 2930F Switch Series provides performance, security, and ease of use for enterprise edge, SMB, and branch office networks. High-Performance Access Layer Switches The Aruba 2930F Switch Series provides performance, security, and ease of use for enterprise edge, SMB, and branch office networks.Optimized for the digital workplace with unified management tools such as Aruba ClearPass Policy Manager, Aruba Airwave and Aruba Central. 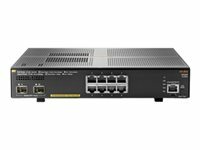 Provides optimal configuration automatically when connected to Aruba access points for PoE priority, VLAN configuration, and rogue AP containment.Stacking with Virtual Switching Framework (VSF) and convenient built-in 1GbE or 10GbE uplinks and PoE+ models deliver right-size network access performance.Robust Layer 3 feature set includes Access OSPF, static and RIP routing, ACLs, sFlow, IPv6 with no software licensing required. 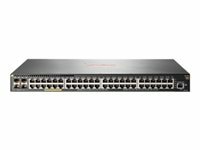 Performance and Power at the Edge The Aruba 2930F Switch Series is designed with a powerful Aruba ProVision ASIC, to enable the mobile campus with SDN optimizations, low latency, increased packet buffering, and adaptive power consumption.Increase performance with selectable queue configurations and associated memory buffering that meets your specific network application requirements.Virtual Switching Framework (VSF) virtualizes up to four physical switches into one logical device for simpler, flatter, more agile networks.Supports up to 740W of internal PoE+ power for wireless access points, cameras and phones. Security and Quality of Service You Can Rely on The Aruba 2930F Switch Series includes security and quality of services features to build a network that meets ever-changing corporate policies and compliances while protecting your data from both inside and outside attacks.Flexible authentication options include standards based security protocols such as 802.1X, MAC and Web Authentication, to enhance security and policy-driven application authentication.Powerful, multilevel-access security controls include source-port filtering, RADIUS/TACACS+, SSL, Port Security, and MAC address lockout. Simplify with Integrated Wired/Wireless Management The Aruba 2930F Switch Series supports Aruba ClearPass Policy Manager for unified and consistent policy between wired and wireless users and simplifies implementation and management of guest login, user onboarding, network access, security, QoS, and other network policies.Supports Aruba Airwave Network Management software to provide common platform for Zero Touch Provisioning management, and monitoring for wired and wireless network devices.Cloud-based management supported by Aruba Central.RMON and sFlow provide advanced monitoring and reporting capabilities for statistics, history, alarms and events.Out-of-band Ethernet management port keeps management traffic segmented from your network data traffic.